We make social media marketing simple, easy, and affordable! Our goal is giving you quality social media solutions at low prices to have an edge over your competition, and for some extra fun along the way! If you have any questions about our website, specific requests for social media services, or any other inquiries, please contact us at [email protected]. You can also reach out to us by using the live chat at the bottom of your screen. If we happen to miss your customer service request, please leave us the necessary details so we can get back to you as soon as possible! Using ShareSupplier is as easy as 1-2-3! 1) Sign up to place orders on our secure server! Social media marketing has never been easier; this is do-it-yourself marketing at its finest. All you need is a few clicks and a link to start seeing results. Click the image above to sign-up now. 2) Choose a safe and secure solution to order! Feel safe knowing that ShareSupplier never accesses your social media account and wants you to see results. Your safety and confidentiality are always our top priorities. E-mail us with any questions. 3) Submit your order and then see results fly! Majority of our solutions deliver instantly or very quickly. You can find estimated delivery times of our solutions and info about each of them below the submit button on each service page. 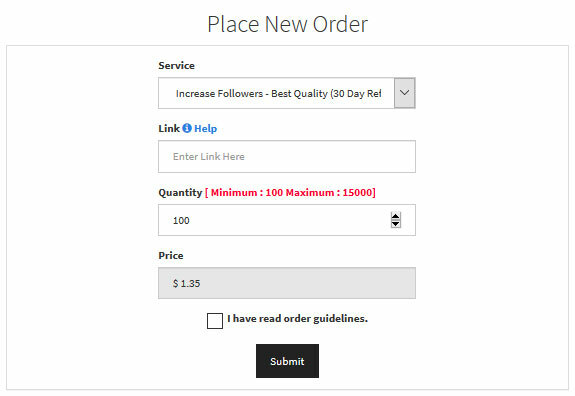 When making an order on sharesupplier.com you will need to submit a link and a quantity of the service of your choice. We have programmed bulk discounts into our prices so the more you buy the lower the unit cost! Please read the important information about each service that is found below the submit button on every page. We want you to see results and have a good experience on our website, and this means knowing the correct links to be submitted! *If you make a lot of large orders, please contact us about our premium membership account to save you some money. We are a group of friends that like to use these social medial tools for our own businesses and for fun. Our main goal was to provide you all with the same services other companies do, but at lower prices. We recognized issues in the services other social media providers are sharing with you, such as a lack of customer support and orders not delivering without refunds being given. *Remember to read the order guidelines about each service you are using to ensure that you understand delivery times and how each solution works. Sometimes orders can get stuck, but rest assured we will always refund you if it does not complete. This is our guarantee to you! If it seems that one of your orders is stuck in processing, please contact us through the live chat for help. ShareSuplier's mission is about giving everyone an inclusive list of social media marketing tools for the most popular social media platforms at the lowest possible prices. Please contact us if you have any questions about using our website or if you have any custom online solutions for us to figure out. 1) Our service pages include an extensive amount of information about each solution. *We want you to know what you are buying and to get good value for your money.ShareSupplier focuses on providing you with a comprehensive list of Instagram, Facebook, YouTube and Soundcloud services. We are proud to offer a unique list of Instagram solutions that no other retailer has, which are very good for ranking content to gain extra exposure on this very busy social media platform!. 2) We are here to help you through the process. *Email [email protected] for any detailed inquires that you may have. *Our chat is always live. If our team is unable to get back you right away, be ensured that we will see your message and try to deal with your inquires as soon as possible! If you are unable to reach us via chat please send an email. *We do private and confidential private consultations for businesses, brands and others like you!